Clogged Drain? Call Roto-Ruthless. Josie lounges on the job for the cover of “Lady Killer” Series 2 #2. At the opera it ain’t over ’til the fat lady sings, in Josephine Schuller’s world it ain’t over ’til there’s a hammer hanging out of that diva’s noggin’. 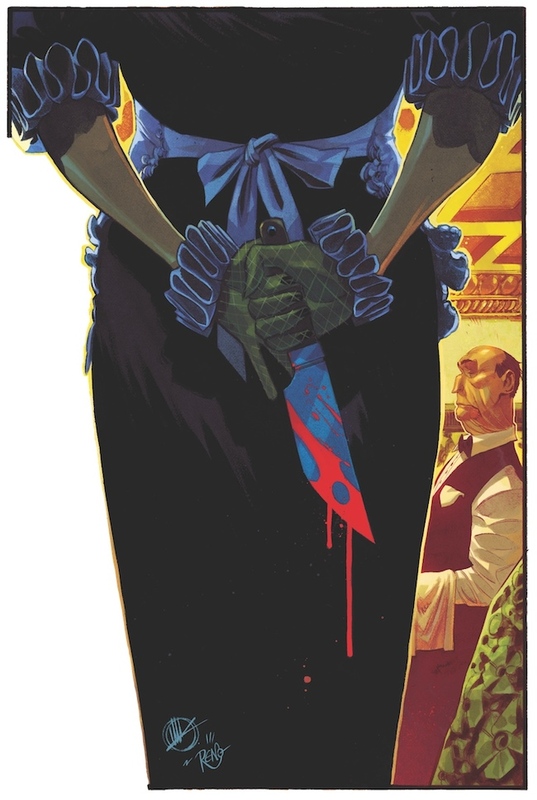 Writer and artist Joelle Jones and Dark Horse Comics return to the swingin’ 60’s for a second round of adventures with the one woman suburban death squad known as Lady Killer. Series 2 will span 5 issues, with number 1 on sale in August. 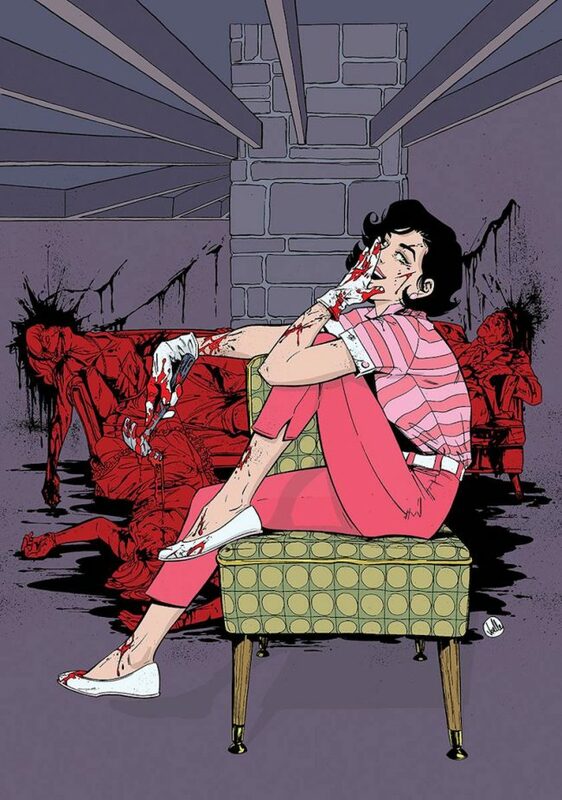 “Lady Killer” 2 #1, Dark Horse 30th Anniversary Variant Cover by Matteo Scalera and Moreno Dinisio. The series is one of my favorites in recent memory. It’s a totally over the top romp through buckets of blood where career juggling housewife and mercenary Josie has more than one use for a bottle of bleach. This time she’s trying to launch her own slash for cash business while keeping a handle on family matters and new digs in Cocoa Beach, Florida. Dirty deeds, done at a reasonable discount. No Greens Stamps please. Joëlle Jones interior art continues to render the mood and details of the early 1960’s settings perfectly, eliciting the feel of classic magazine advertising. The gizzard splattered covers remind me of bizarre twists on artist Jack Vettriano‘s retro-tinged scenes. Want to watch every stereotypical misogynistic moron end up a puddle of gore? The local gossip dissolved in an acid bath? Just hop in the yellow V8 and take a ride with an anti-heroine who balances “Jackie O” style with “Jack the Ripper” mayhem. Hmm. Guess Josie won’t have to deliver that Tupperware after all. 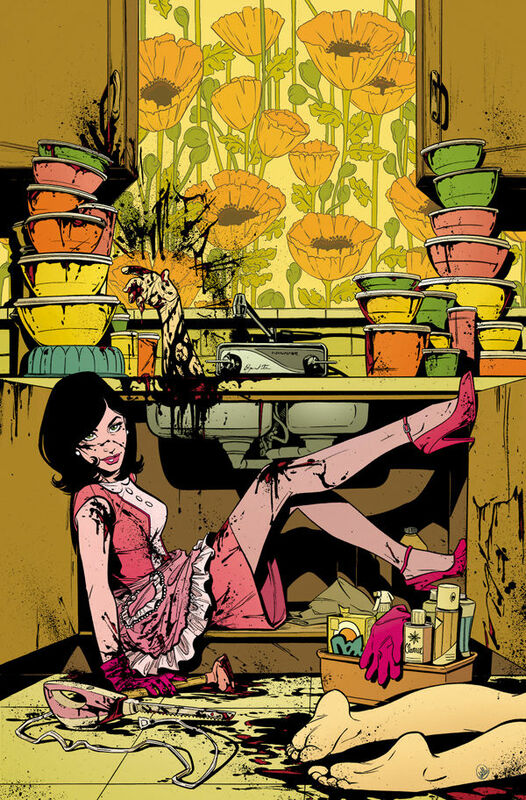 Joelle Jones’ cover for “Lady Killer 2” #1.